All RJM granules are ISO NPG, thermoset, polyester based solid surface granules. They are flame retardant, chemical and stain resistant, heat resistant and UV stable. The granules can be easily sanded and machined and achieve a Class I fire and smoke rating. DC Granules are the individual colors used in our granite effect blends. Most are available in -18+145 (medium) and -36+145 (small) mesh sizes. 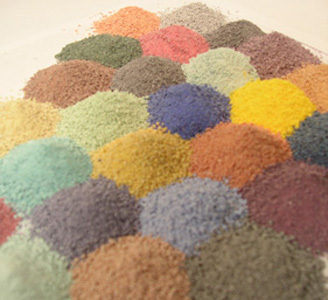 These colors can be added in various proportions to our Densified Granite Effect or Stone Fill blends to add increased density and color, or to alumina trihydrate or calcium carbonte to achieve uniquely custom granite blends. DC, HG and HGS granules are the individual colors used in our granite effect blends. These colors are representative of the granules cast in clear resin.